This post first appeared on Spatone’s blog and I am grateful for their support and for the intro into cycling. I stayed with relatives the night before the Cycletta and did not sleep well as was anxiously awaiting the alarm and didn’t want to be late. 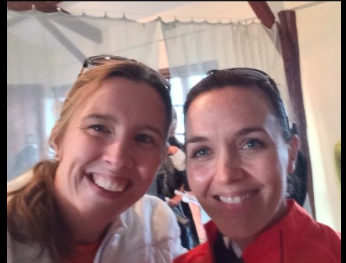 Having never really done a “race” of any kind, I was nervous about how the event itself would work. I was driven to Losely Park and arrived as dawn was creeping in around the misty grandeur of the big house. If it weren’t for the lycra I would have thought I’d stepped into Downton Abbey. But from then on there was no real reason to be nervous; everyone was so friendly and super helpful. The atmosphere amongst everyone was really friendly. I made my way over to the British Bike Hire tent, and was unbelievably impressed at how quick and easy it was to be kitted out for my rental bike – which went like a DREAM. Then on to breakfast. We all milled around nervously, waiting for Victoria to arrive – when she did so, she was personable, inspiring, witty, and passionate about a variety of topics – top of which is women in cycling and eating well, We also talked about Strictly ball dresses and her Olympic lycra too which she apparently keeps at the bottom of her wardrobe. Someone also asked about selfies with her and we all flooded in – she couldn’t have been more up for it – even getting a better angle for the one she took with me! So then to the start, I was doing the novice 20k distance – and we were briefed on the very big hill quite which Kerry from Revolution had also warned of us about – so now I was getting quite worried about it. We were advised there was no shame in getting off to push if needed. Off through the Downton-esque drive, gently gliding over the speed bumps and out into Surrey’s Sunday morning. The marshals at key points were helpful and encouraging. I was one of the later starters, and so on arrival to The Hill there, I noticed a couple of people walking, and I encouraged them as I went past – “come on ladies!” I then went round a corner to discover that The Hill really did go ON and ON. I changed down gears and then ran out of lower gears. “I will not get off, I will not get off” I was saying to myself. I did stop for a breath (foolish girl!) and took a minute to catch it but I did not get off, go me!) Once I got going again (Mental note to self for future: stopping means you have to start from scratch) it was pretty much okay. To arrive back in the park, and see my husband and children cheering me on as I finished was absolutely amazing – I had to be reminded by a marshall to dismount – I was ready to do a victory lap! My phone beeped with my time – I had done a PB by some margin so was beyond pleased with myself. I then went to the relaxation tent and did a cool down stretch and a sports massage. 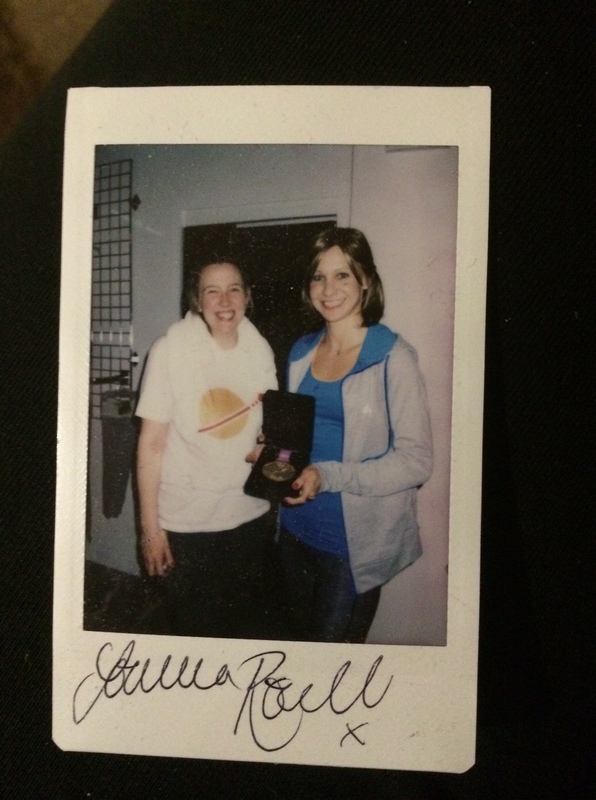 This picture of me grinning with my medal received nearly as many likes as when I had my twins – and to be honest it’s right up there with some of my proudest moments. Doing something that was so far outside my usual comfort zone that has given me so much enjoyment and confidence. I can’t wait to do another Cycletta next year, this time the 40km! 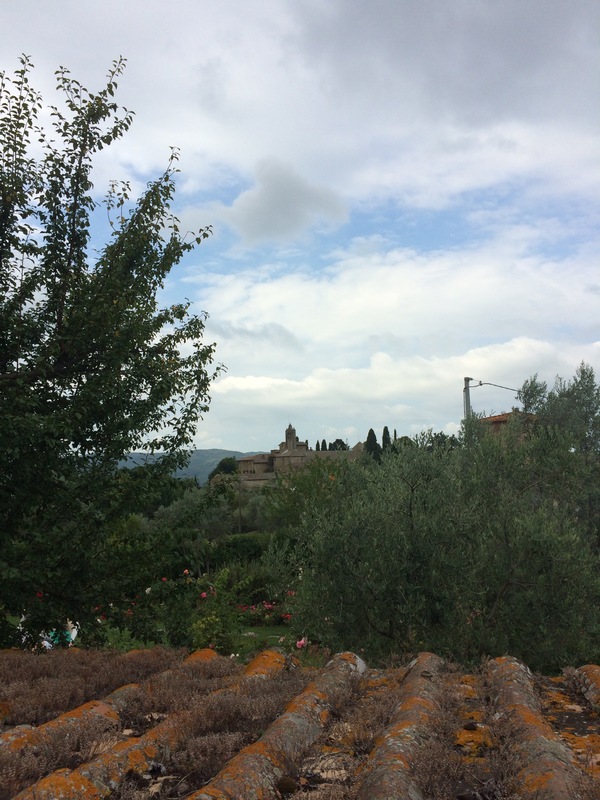 Views over Tuscan countryside from my exercise bike. September is a great time to get back into the swing of things with the whole new shiny academic year thing going on. Already, I’ve learnt a lot. That doing any long stints on a stationary bike is boring, even if you have a glorious Tuscan hillside vista to enjoy. I am fitter and leaner than I was (have lost 3lbs) , despite eating huge quantities of all Italian delicacies on our holiday, pasta, white bread, ice cream. 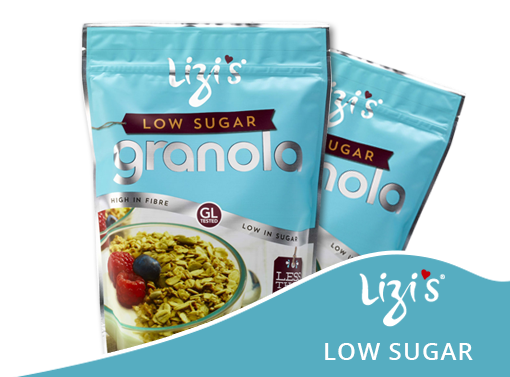 Since my return, I have discovered Lizi’s Low Sugar Granola which I’ve been having with almond milk to add more protein on Emma’s advice to my previously very high gi breakfast of weetabix with lots of sugar. Coupled with my morning Spatone which has become part of my every day routine, I am definitely feeling more energised. At the time of writing we have 37 days to go until the event, and it’s starting to hit home. I usually manage to be very solitary while I ride and choose quiet times of day and low traffic rural roads, I absolutely LOVE the thinking time and space it gives me. So I am nervous about cycling alongside so many other people on the roads on the day. I’m also a bit anxious about the hills. But, I am very excited about the challenge day and know that I will be SO proud of myself when I have finished. Wow. 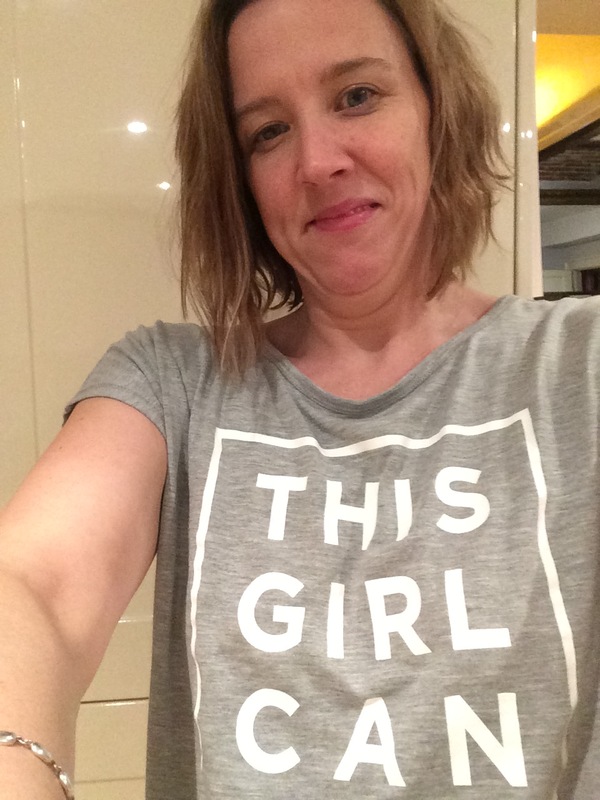 I can’t believe its over a month since my last blog post – and my rather exciting trip to London. I was very nervous on arrival at Boom Cycle – it was very sleek and modern and every one was Lycra’ed up. I was wearing my husband’s T-shirt as I don’t have any gym stuff that fits me. Having been a member of various gyms over the last few years I have seen people on their way out of spinning classes looking like they were about to pass out from exhaustion, so I was very scared. But my fears were unfounded. It was absolutely awesome. I loved the low level lighting (which meant that no one saw when my foot came out of my cleat!) and the music was completely brilliant too. My radio is usually firmly tuned to Absolute 80s, so it was outside my comfort zone too but I loved it. While the feminist in me was unimpressed about the lyrics on listening again later, I was loving the tune of Jason Derulu’s Talk Dirty and giving it large on the pedals. The energy and enthusiasm of the instructor was contagious and I felt really motivated while I was there. I will confess to a bit of self preservation – I was probably only giving about 75%. I wasn’t sure how long the class was going to be and frankly, I didn’t want to fall off! Or worse be so sore that I wouldn’t be able to function the next day with four children. I was rather saddle sore as although Joanne’s warm down was great, I think no amount of stretching was going to counteract the force with which I was sinking down onto the saddle in relief after the standing “sprints”. I was super grateful for a wonderfully nutty delicious recovery smoothie at the end of the class. So on finally getting home, my next challenge to overcome was to find a bike: it’s going to be pretty hard to do without one. I last bought one in the last century and it was care of the bank of Mum and Dad – things appear to have changed massively since then. There is SO much choice – I was utterly overwhelmed and slightly taken aback by the cost. So I decided that until I get into the saddle a bit more, I am firmly sticking to a second hand hybrid found locally online. Once I got it home I gave it a quick once round our garden to my two sons’ delight – they joined in on their bikes – they have them but my husband is yet to get one but I think I have inspired him that he needs one too, now. I’ve been taking Spatone for years now (since my first pregnancy) whenever I feel run down. 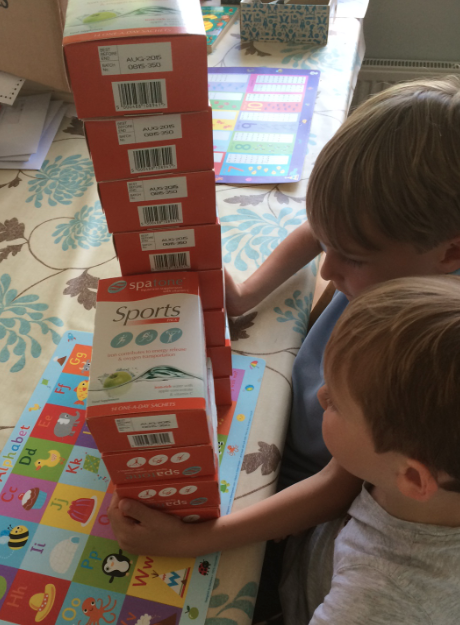 It was recommended by someone on Mumsnet and I always have a packet in the cupboard so it was great to have my training supply arrive in one go- the boys had great fun with the boxes! Taste wise it doesn’t bother me, I usually pour it into a small glass of OJ – as I’m pretty sure the vitamin C helps the absorption of the iron. Going out on the road is a bit of a leap for me as I have learnt to drive a car since I last cycled on the road as a student in the relative cycle haven of the streets of Oxford. I now live in cycling friendly sub rural Hertfordshire – many of my friends are triathletes and there are regularly cycle groups going past but I am terrified very wary of the BIG lorries and the impatient school run mums (ahem) who are doubtless muttering about cyclists. Ride 1: around my (not very big) garden -I felt like my 15 year old self again, wheeling down the small slope and just riding for the joy of it – my kids LOVED watching me. Ride 2 : to check whether a sign had been put on a noticeboard nearby for an event – trying out the shimano gears – bit of a serious fail there and I found myself in the wrong gear utterly. Ride 3: to deliver a form to a neighbour – felt brilliant to be out but it wasn’t a busy time of day and I pottered there and back. Ride 5: Right – I really must go out and get started on this. I put my Spatone top on to remind myself of why I was doing this and chose a quiet time of day and did a 4 mile loop- only 20 minutes or so but I am breaking myself in slowly. This was my longest ride so far and I was out of breath when I got home – need to make sure that i am properly ready. I am still waiting to speak to Kerry from Revolution and Emma the nutritionist – we have been playing voicemail tennis, so I am still overdoing the Double Deckers and underperforming on my bike – am hoping this will change by my next update. So here I am with 15 weeks to go until the big day – plenty of time but PLENTY to do.